The North Carolina Maritime Museum, in partnership with the North Carolina Coastal Reserve/National Estuarine Research Reserve, plans to give students an opportunity to learn about the natural and maritime history of coastal North Carolina through creative, hands-on experiences. 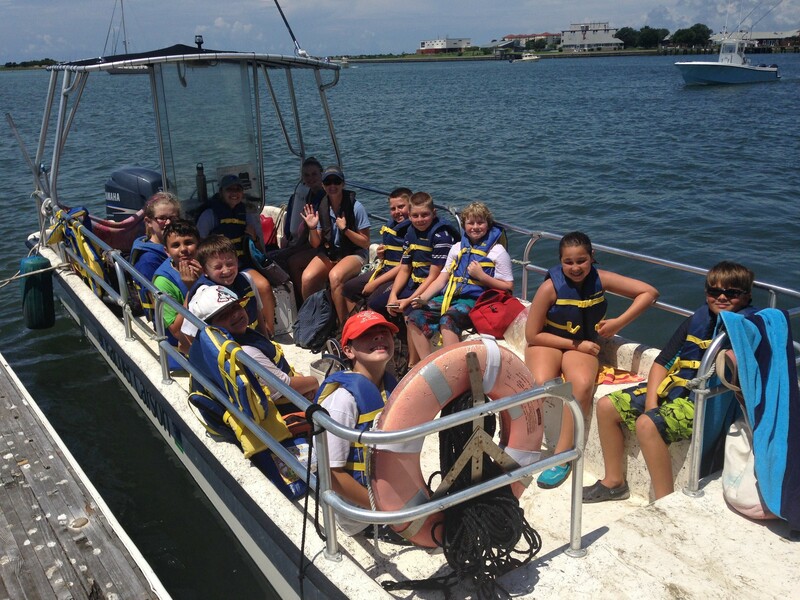 For over 50 years, the Summer Science Program has taught children the wonders of the maritime environment. These courses are offered from June through August. “Summer Science School programs are my favorite programs of the year. It is awesome to watch the children’s passion and curiosity blossom as they encounter new experiences as pirates, explorers, fishermen, and scientists,” said Christine Brin, School & Group Coordinator for the North Carolina Maritime Museum. “These Museum programs give students a chance to explore the maritime world and develop a deeper appreciation and understanding of the maritime environment,” Brin said. Several of the classes are offered in partnership with the North Carolina Coastal Reserve/National Estuarine Research Reserve. These are hands-on classes that are field-based that bring North Carolina’s coastal environment and culture to life for many children. June 12, July 10, August 7; 9 a.m.–10 a.m.
Preschool children will enjoy a story, estuarine critter observation and a related craft. The program is free; advance registration is required. Pirate food, clothes, and treasure! Ten young pirates and their fearless captain will work together to learn how pirates like Blackbeard lived, dressed, ate and worked. The pirate crew will work together to set the rules of the ship, learn some battle skills with their wooden weapons and, at the end, go on a pirate-worthy hunt through the Museum to locate hidden treasure. Advance registration is required. Fee: $65. Investigate coastal marine life of the tidal flats, salt marshes and sounds on local islands during this two-day class. The field-based classes include ferry ride, barrier island hiking and animal identification. Fee: $60. Build a model of a sportfishing boat at the Museum’s Watercraft Center. Use Museum exhibits and field trips to learn about boats used for offshore charter fishing and some of the fish targeted by fisherman aboard these uniquely designed vessels. Fee: $95. This course is an introduction to coastal fish and fishing methods. Cane poles, bait, and tackle are provided for dock fishing for this two-day class. Students also use nets to catch and identify marine life in near-shore waters. Fee: $75. Investigate estuarine habitats, plants, and animals through field and lab studies. This three-day course includes a field trip to the Rachel Carson National Estuarine Research Reserve, water quality testing, plankton identification using microscopes, and many more activities. Fee: $60. July 22-26; 9 a.m.-2 p.m. The staff of the NC Maritime Museum and the Rachel Carson Reserve are pairing up to create this unique camp that combines history and science to understand the local maritime environment, culture, and history of the coast. Topics include sea monsters, plankton, cetaceans, pirates, and more! Students will be asked to participate in field trips to local sites such as Beaufort’s Old Burying Ground and in hands-on experiments including small creature dissections and chocolate chip excavations. Fee: $100. According to Lori Davis, Education Coordinator for the Rachel Carson Reserve, the site has been an integral part of the Summer Science Program since 2010. “We provide children with the opportunity navigate through the estuarine habitats and discuss the variety of flora and fauna that exist on the island,” she said. The emphasis throughout the Summer Science Program is on small class sizes to encourage active participation. Students travel with instructors by van or boat to field sites. Only registered children may attend classes. Lodging facility is not available; parents/guardians provide transportation to/from class daily. There is a course fee for all classes, and advance registration is required as space is limited. Parents are encouraged to register children for any or all of the sessions by contacting North Carolina Maritime Museum Program Registrar Frances Hayden at 252-504-7758 or frances.hayden@ncdcr.gov. Early registration is encouraged to ensure participation. The North Carolina Maritime Museum is located at 315 Front Street in Beaufort. The Museum is open Monday thru Friday 9 a.m. – 5 p.m., Saturday 10 a.m. – 5 p.m. and Sunday 1 p.m. – 5 p.m. The Museums is open to the public with free admission. Donations are always appreciated. For more information on educational programs and events, visit www.ncmaritimemuseumbeaufort.com. Click here to download the 2019 Summer Science Brochure.